Marvel Comics has been based in Manhattan since the late 1930s founding of the company that evolved into Marvel in the early 1960s. 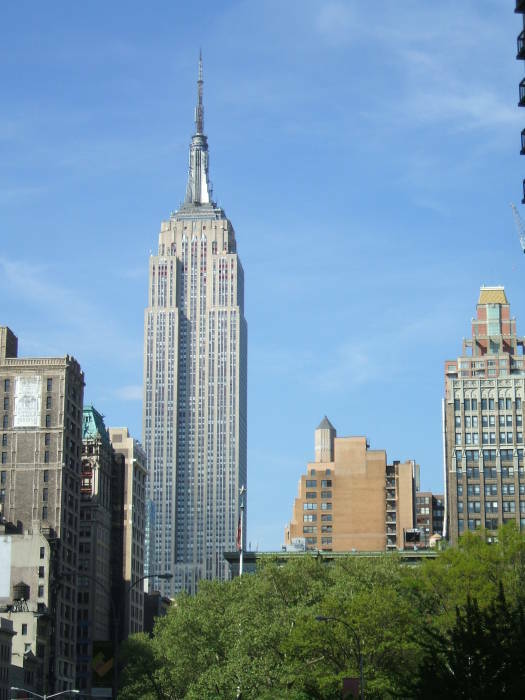 Its story lines and art have often featured New York. Some of Marvel's prominent writers and artists including Stan Lee and Jack Kirby were born in New York, the sons of recent immigrants. Here are the places where the company has operated and where some of those people and worked and lived. Benjamin and Rose Kurtzberg were Jewish immigrants who came from Austria to New York in the early 1900s. They lived in an apartment in this red brick building at 147 Essex Street on the Lower East Side of Manhattan, and Benjamin worked in a garment factory. Their son Jacob was born on August 28th, 1917. Jacob loved the movies and was inspired by the work of comic strip artists Milton Caniff, Hal Foster and Alex Raymond, and also by editorial cartoonists including C.H. Sykes, two-time Pulitzer-Prize-winning Jay "Ding" Darling (published in the New York Herald Tribune), and Rollin Kirby, who won three Pulitzer Prizes and drew for the New York Mail, New York World and New York Post. He enrolled at the Pratt Institute in Brooklyn but was just there for either a day or a week, probably due to the cost. Jacob found work as an artist at the Max Fleischer studios. He worked on Popeye cartoons as an "inbetweener", a cartoonist who fills in the motions in the frames between those key frames defining major movements. But after a few months, labor unrest at that studio drove him to leave. He started working at Lincoln Newspaper Syndicate in 1936, staying there for three and a half years, until late 1939, as a political, gag, and strip cartoonist. This also included things like single-panel advice cartoons, which he drew under the pseudonym Jack Curtiss. At the same time he was at Lincoln, he was also working as part of the large artists' studio of the Eisner and Iger Studio, a comic-book "packager" firm that created comics on demand for publishers. Eisner and Iger created comic books for publishers just getting into that new medium in the late 1930s, and sold color comic strips to newspapers. Co-founder Will Eisner said that they had rented a small one-room office in a building on 41st Street just off Madison Avenue for just $5 per month. Looking south on Essex Street past the Kurtzberg home. 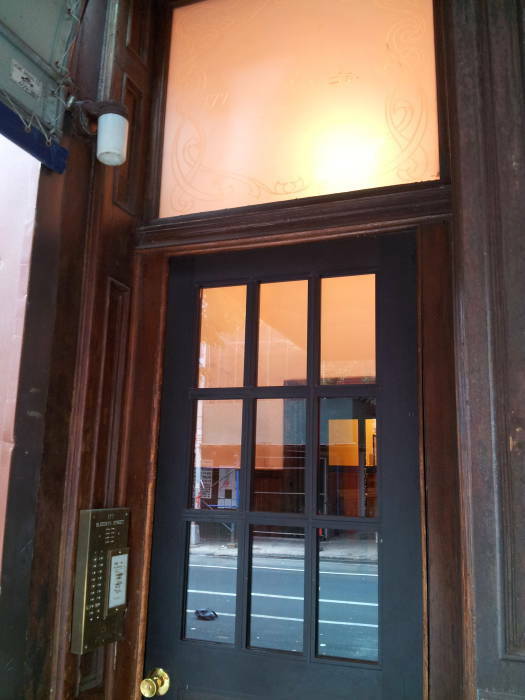 147 Essex Street on the Lower East Side was the childhood home of Jacob Kurtzberg, later known as Jack Kirby. A plethora of pseudonyms made the firm appear to be larger than it really was. Continuing to use the pseudonym Jack Curtiss, Jacob drew an adaptation of The Count of Monte Cristo. As Curt Davis, he drew the weekly science fiction serial Diary of Dr. Harward. As Fred Sande, he drew his first western comic, Wilton of the West. He drew humor features Abdul Jones and Socko the Seadog as Ted Grey and Teddy, respectively. Jacob Kurtzberg eventually settled on the pseudonym Jack Kirby. It was reasonably similar to his actual name and it reminded him of the popular actor James Cagney. The Kurtzbergs moved to Brooklyn in the summer of 1940. Jacob, now professionally known as Jack, began working for Fox Feature Syndicate, a comic book publisher and newspaper syndicator. This was his first entry into superhero work, initially with The Blue Beetle, one of the first costumed hero figures. Kirby began working with Fox editor Joe Simon. Both soon left Fox — Simon became the first official employee at Timely Comics, one of several pulp magazines published by Martin Goodman. Goodman had traveled around the country living in hobo camps during the initial part of the Great Depression. In 1931 he was involved in the founding of Columbia Publications, one of the first pulp magazine publishers. He left Columbia within a year to found other companies that seem to have operated under intentionally inconsistent and confusing names. Kirby soon followed Simon to Goodman's Timely Comics. Goodman had two star characters at Timely, the Sub-Mariner (created by Bill Everett, who had worked next to Kirby at Fox) and the Human Torch. Simon and Kirby began creating more heroic characters, including Hurricane, Tuk the Cave-Boy, Mercury, the Vision, Red Raven, and Comet Pierce. Simon conceived the idea for Captain America in 1940 and sketched the character in costume. Goodman gave the character the go-ahead, directing that a comic book series be published as soon as possible. Simon wrote it, and Kirby drew it in pencil. Al Liederman inked it, and Simon and Kirby's regular letterer lettered it. Captain America Comics #1 went on sale in December 1940, over three months after Germany invaded Poland to start World War II. The U.S. wouldn't enter the war until the Japanese attack on Pearl Harbor in the following December, but Nazi Germany had been implementing repulsive policies since the early 1930s and U.S. involvement in a war had seemed inevitable for some time. 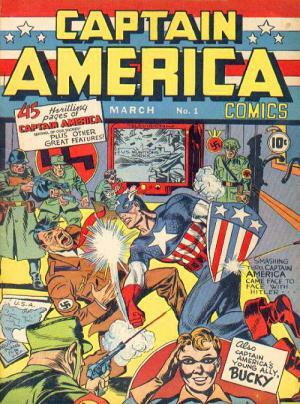 The first issue showed Captain America punching Nazi leader Adolf Hitler. Nearly a million copies were sold of the first issue, and circulation remained close to a million copies per monthly issue, exceeding the circulation of news magazines like Time. While Captain America Comics #1 went on sale in December 1940, its cover listed the following March as its date. After the first ten monthly issues were published to great success, it became clear to Simon and Kirby that while they had been promised a share of what was turning out to be a lucrative income, they were getting very little. They left Timely for National Comics, soon renamed DC, home of Superman and Batman. As for Timely's characters, including Captain America, Goodman turned them over to his other writers and artists. These included his wife's cousin, Stanley Lieber, who had been hired in 1939 as a general office assistant. Lieber was appointed editor of the comics line, a position he held for decades except for his three years of military service during World War II. At this point it is probably expected that I be the complete fanboy and say that Jack "King" Kirby could do no wrong. Sorry, but it seems to me that he was a bit of a flake who behaved erratically, often didn't get along well with others, and sometimes told stories that showed either a very poor memory or willful distortion. Kirby and Simon had been negotiating their new positions with National while still working for Goodman. They were concerned that Goodman would not pay them if he found out. Eventually he did find out, as Kirby and Simon went on to leave Timely for National as they had planned. But the two were upset with Lieber, believing that he had exposed their plan to leave Timely during that final ten months. Kirby was then drafted into the U.S. Army. He was a combat infantryman with the Fifth Division, commanded by General George Patton. He fought in the campaign at Metz, in northeastern France near the border with Belgium, Luxembourg and Germany, earning a bronze battle star and the Combat Infantryman's Badge and suffering a severe case of frostbitten legs and feet. Stanley Martin Lieber, known by his pen name and eventually legal name, Stan Lee, was born on December 28, 1922, in his parents' apartment at the corner of West End Avenue and West 98th Street. The old neighborhood has changed quite a bit since then. Southeast corner of West End Avenue and West 98th Street on the Upper West Side of Manhattan. Southwest corner of West End Avenue and West 98th Street on the Upper West Side of Manhattan. Northwest corner of West End Avenue and West 98th Street on the Upper West Side of Manhattan. Northeast corner of West End Avenue and West 98th Street on the Upper West Side of Manhattan. Stan's parents, Jack and Celia (née Solomon) Lieber were Jewish immigrants from Romania. Jack was trained as a dress cutter, but he worked only from time to time after the Great Depression began in 1929. The family moved farther north in Manhattan, to Fort Washington Avenue in Washington Heights. 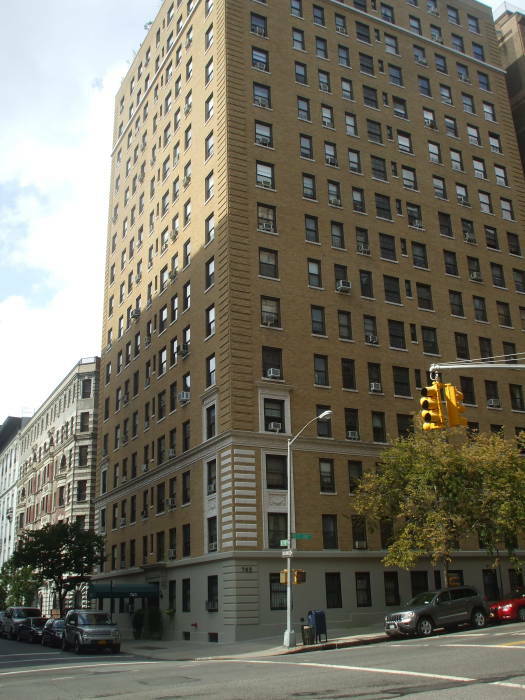 By the mid 1930s the family, now including Stan's younger brother, were in a one-bedroom apartment at 1720 University Avenue in The Bronx. Stan attended DeWitt Clinton High School in The Bronx, graduating early at age 16½. In 1939 Stan became an assistant at Timely Comics, through his family connection as a cousin of publisher Martin Goodman's wife. Timely would evolve into Atlas Comics in the 1950s and Marvel Comics by the early 1960s. Stan's initial work was low-level — filling inkwells and erasing pencil sketching from the inked pages. His first writing credit was for "Captain America Foils the Traitor's Revenge", a text filler piece in Captain America Comics #3, May 1941. He used the pen name "Stan Lee", explaining that he wanted to save his given name for authorship of more literary pieces. He became the interim editor at Timely in 1941, at the age of just under 19. Excelsior! Almost immediately, however, he entered the U.S. Army in early 1942. He served stateside in the Signal Corps, writing manuals and training films. He left military service in 1945 and returned to the comics. In 1951 Stanley Lieber legally changed his name to what had been his pen name, Stan Lee. Lee fell back on his core gifts: an eye for talent, a gift for gab, and an endless supply of energy. He was a prolific writer but not a particularly distinguished one (his cornball dialogue paled in comparison the urbane snappiness of Carl Barks’s Uncle Scrooge or John Stanley’s Little Lulu). But more than any other editor in comics, Lee was sensitive to dynamic art, and he was able in 1956 to recruit the two most visionary artists to ever work in superhero comics, Jack Kirby and Steve Ditko. Lee as creator of the Marvel Universe was a myth. Kirby and Ditko were the main creators of the characters and they plotted out most of the stories they worked on. Lee added the dialogue in after the fact. And the dialogue was always the weakest part of any comic he worked on. Lee’s true genius was not as a writer or creator but as an editor, who brought the best talent to Marvel and pushed writers in the right direction, helping them flourish. Timely Comics operated out of Suite 1401 in the Empire State Building 1941-1951. 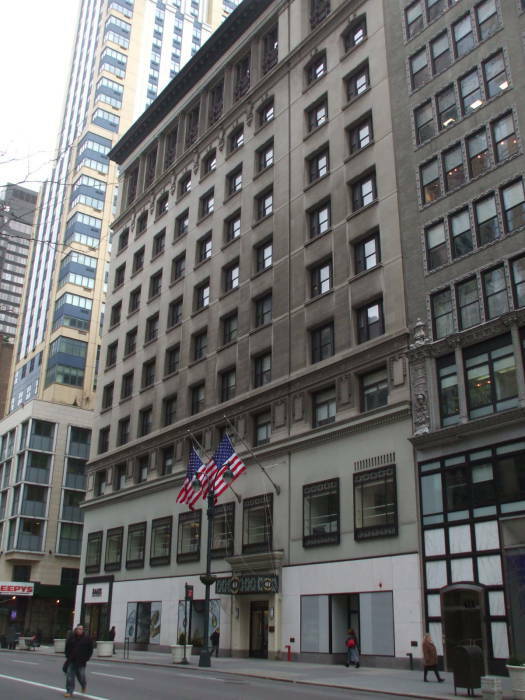 Timely Comics had moved from the McGraw-Hill building at 330 West 42nd Street to suite 1401 in the Empire State Building in 1942. Timely was the comics arm of Goodman's pulp publishing company, putting out a variety of titles. One of these was called Marvel Comics #1, in October of 1939, featuring the Human Torch and Namor the Sub-Mariner. This became Marvel Mystery Comics with issue #2 in December, 1939, continuing under that title through June of 1949. The Golden Age of Comic Books was generally considered to be about 1938-1950. Timely's "big three" stars of this period were the Human Torch, Sub-Mariner, and Captain America. Timely's main competitor, the sister companies National Comics and All-American Comics, later to evolve into DC, had Superman, Batman and Wonder Woman. Lesser competitors were Fawcett Publications, Quality Comics, and Lev Gleason Publications. The superhero titles thrived during World War II. But after the war, the superhero stories fell out of fashion. Goodman's Timely turned to other genres including war stories, crime, westerns, and horror. The Sub-Mariner and Human Torch titles ended in July, 1949, and Captain America ended in February 1950 after two final issues as Captain America's Weird Tales. In November 1951, Goodman began using the Atlas News Company logo on his company's comics. As Atlas, Goodman's comics further diversified into men's adventure-drama, jungle adventure, medieval adventure, romance, espionage, Bible stories, and sports. Goodman followed popular movie and TV trends—westerns, war dramas, romances—and the horror line of Entertaining Comics or EC. Supposedly Goodman discovered a cache of paid-for but as yet unused artwork at one point, and fired almost all of his staff for up to six months until the artwork was used up. Editor-in-chief Stan Lee was one of the few staff members to stay employed throughout this period. The market for pulp magazines was shrinking, and Goodman transitioned to more conventional and mainstream magazines as well as paperback books. He also published a line of men's magazines starting in the 1950s and continuing into the 1970s including Stag, For Men Only, and Male. Jack Kirby had returned from the war in Europe in 1945 to work on a variety of projects with Joe Simon. Their biggest successes were romance comics, primarily Young Romance followed by Young Love and Young Brides in Love, all for Crestwood Publications. In late 1953 or early 1954, Kirby and Simon started their own comics company, Mainline Publications. It published four titles in 1954 and 1955: the romance In Love, the western Bulleye: Western Scout, the war comic Foxhole, and the crime drama Police Trap. Simon left comics for advertising in 1955, and Mainline shut down. Jack Kirby was doing free-lance work for both Goodman's Timely/Atlas company and their competitor National, later to become DC (they used the DC logo on their covers starting in 1940, and were commonly known as DC for many years before officially adopting that name in 1977). By 1959 Kirby was working almost entirely for Timely/Atlas, having left National over a contractual dispute. His full time employment with Timely/Atlas, soon to become Marvel, really started with Strange Stories #1, for which he drew the cover and the seven-page story "I Discovered the Secret of the Flying Saucers." Collectors refer to the comics starting with the April 1959 issue as "pre-superhero Marvel", a period in which Kirby was drawing the covers. Kirby is described as having "lingering resentment" of Stan Lee over his perception of mistreatment in 1941. But Kirby's work with Lee, who was the company's editor-in-chief and art director for much of the time from 1945 until 1972, is what Kirby is best known for today. Some comics had been published with "Marvel" on the cover, including Marvel Comics #1 in October, 1939. But it was really in 1961 that Marvel Comics came into being, with a "superheroes in the real world" approach used for the line of comics now formally branded Marvel. Some of this may have been simple necessity, as National/DC controlled the distribution of Marvel comics after Goodman's business debacles in the mid 1950s. National/DC comics had costumed heroes with secret identities, ideal archetypes in stories largely written for pre-teen readers. Goodman had asked Lee to develop a superhero team in response to the National/DC Justice League of America. Lee's creation was the concept of a hero who was human, physically and psychologically imperfect. As natural as that is, it was quite the imaginative innovation in the world of comics. The "Marvel Method" that evolved had Lee brainstorm with the artist, with Lee then writing a plot synopsis. The artist would then turn in pencilled artwork for the allotted pages and panels, the visual part of the storytelling. Lee would write the text, creating the word balloons and captions, and then oversee the inking, coloring and lettering. Lee started the practice of documenting this collaborative process through a credit panel on the splash page of every story, naming the writer and penciller (that is, the original artist) as well as the inker and letterer, whose work previously had been almost entirely uncredited. Stan Lee and Jack Kirby created the Fantastic Four in 1961, with their first comic appearing in November of that year. Lee and Kirby went on to create the Hulk, Iron Man, Thor, and the X-Men. Working with Steve Ditko, Lee created Doctor Strange and Spider-Man. Atlas had tried to revive its superhero line in the mid 1950s. Captain America, along with the Human Torch and Namor the Sub-Mariner in a few titles from December 1953 through September 1954, at which point the characters were retired again. Lee and Kirby revived the character of Captain America in 1964, and the character has continued through today. Kirby left Marvel for National/DC in 1970, returning in 1975 with artistic, editorial, and script control over the Captain America character, and then left again in 1978. This series was indeed strange. Steve Ditko contributed some of his most surrealistic work to the comic book and gave it a disorienting, hallucinogenic quality. Dr. Strange's adventures take place in bizarre worlds and twisting dimensions that resembled Salvador Dali paintings. They involve mystical spells, trances, astral travel, and occult lore. Inspired by the pulp-fiction magicians of Stan Lee's childhood as well as by contemporary Beat culture, Dr. Strange remarkably predicted the youth counterculture's fascination with Eastern mysticism and psychedelia. Never among Marvel's more popular or accessible characters, Dr. Strange still found a niche among an audience seeking a challenging alternative to more conventional superhero fare. Ditko was doing his best work in the early 1960s for Marvel and Lee, but then he abruptly left in 1966 for reasons he never explained. He had been refusing to speak with Stan Lee for some time, all their communication about stories and art work went through intermediaries. Lee said "I never really knew Steve on a personal level" and did not know why Ditko refused to communicate. Ditko has refused all requests for interviews and public appearances since the 1960s. Blake Bell's book Strange and Stranger: The World of Steve Ditko uses a multi-year correspondence he maintained with Ditko for a number of years, until Ditko decided that the author and his publisher were "anti-Ditko" and broke off all contact. Meanwhile, Ditko was becoming more and more fanatical about Ayn Rand and her "Objectivism" philosophy. Well, no one is ever just a little fanatical about Ayn Rand, her disciples tend toward obsession. Are Objectivists atheists? Of course not! Just like their founder, they worship their One True God, Ayn Rand. "From Spider-Man to Ayn Rand", the New York Times review of Bell's biography, details Ditko's descent into obsessive Objectivism. Ditko worked for DC Comics for about a year in 1968-1969, again leaving without explanation. He returned to do some work for DC in the late 1970s, and even did free-lance work for Marvel from 1979 into the late 1990s. As of 2012 he still maintained a secretive studio somewhere in western Midtown. He died in June, 2018. 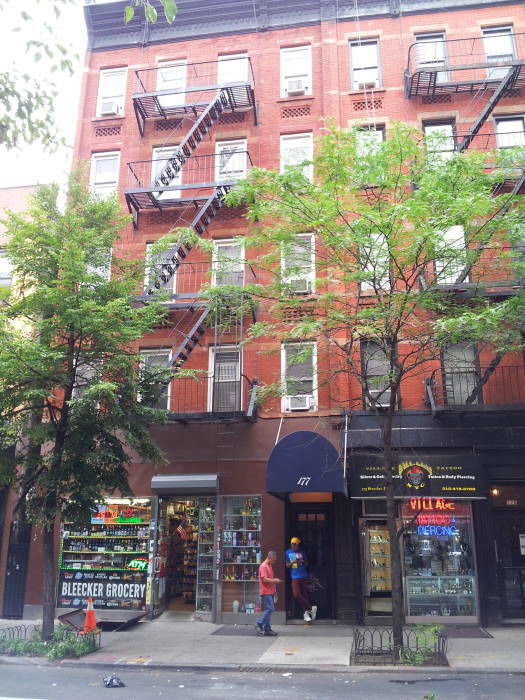 Roy Thomas, Gary Friedrich, and Bill Everett shared an apartment on the second floor of this building at 177 Bleeker Street in Greenwich Village in the 1960s. Thomas wrote a significant fraction of the Doctor Strange stories, including the entire run of stories in #169-183 in 1968 and 1969 and continuing with the character for a few decades. He placed Doctor Strange's townhouse and his Sanctum Sanctorum at the apartment's address. Everett was an artist on Doctor Strange, the co-creator of Daredevil, and the creator of Sub-Mariner. 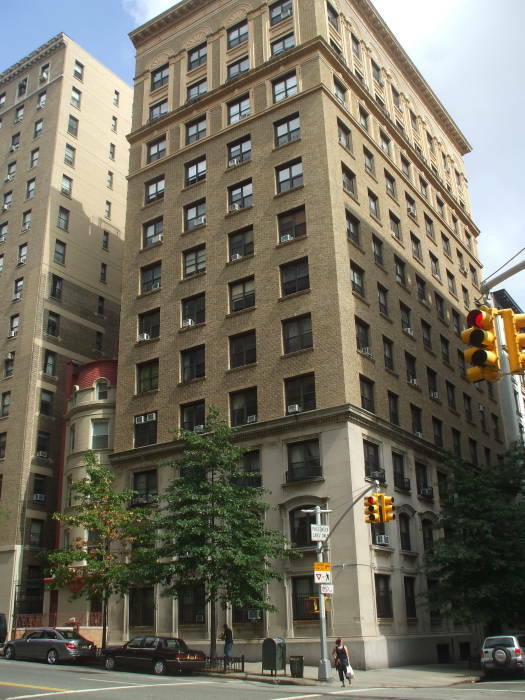 Marvel writers and artists Roy Thomas, Gary Friedrich, and Bill Everett shared an apartment at 177 Bleeker Street in the late 1960s. 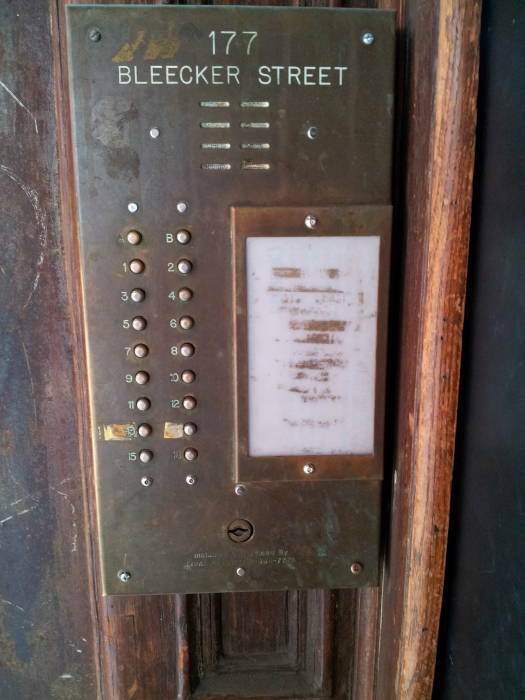 They set Doctor Strange's townhouse at this address. Thomas had a Bachelor's of Science in Education majoring in history and social science. He became a high school English teacher in 1961, and was also very active in early years of comic fandom during the Silver Age of Comic Books, generally considered to run from approximately 1956 to 1970. His letters appeared in both Marvel and DC Comics during the period 1960-1964, and he became an editor of a fanzine in 1964. In 1965 he had just accepted a fellowship to study foreign relations at George Washington University when he received a letter from the editor of the Superman titles at DC. Thomas immediately moved to New York, working at DC for just eight days under extremely high pressure before leaving that position. His letter to Stan Lee led to an immediately invitation to take a writing test at Marvel. The test was four pages of Jack Kirby artwork from the Fantastic Four with the dialogue removed. Martin Goodman had sold his company Magazine Management Company, the parent company of Marvel, to the Perfect Film and Chemical Corporation in 1968. Goodman remained as publisher until 1972, when Stan Lee stepped into the role of publisher. Thomas became editor-in-chief for Marvel in 1972 with Stan Lee's move to publisher. Thomas had already introduced the pulp hero Conan to comics, adding to Robert E. Howard's story lines and launching a sword-and-sorcery trend in comics. In the early and mid 1970s he wrote hundreds of Conan stories. He stepped down from the editor-in-chief position in 1974, continuing with Marvel while writing a wide range of titles. Thomas left Marvel for DC in 1981. He collaborated on the screenplays for Ralph Bakshi and Frank Frazetta's Fire and Ice in 1983 and Conan the Destroyer in 1984. By 1986 he was doing more work for Marvel than for DC. In the 1990s he was writing comic tie-ins for Xena: Warrior Princess and Hercules: The Legendary Journeys. In 2006 he was back to sword and sorcery with another Red Sonja title. Meanwhile, Marvel had moved to Madison Avenue in the northeastern area of the Midtown section of Manhattan. 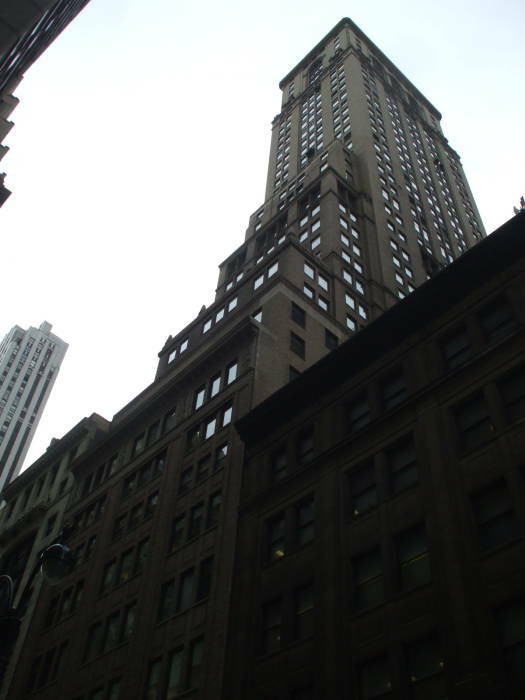 Marvel was based at 635 Madison Avenue in the 1960s until the 1970s. In the universe of their various titles, SHIELD was initially the Supreme Headquarters, International Espionage, Law-Enforcement Division; later the Strategic Hazard Intervention Espionage Logistics Directorate; and in the 21st century, the Strategic Homeland Intervention, Enforcement and Logistics Division. 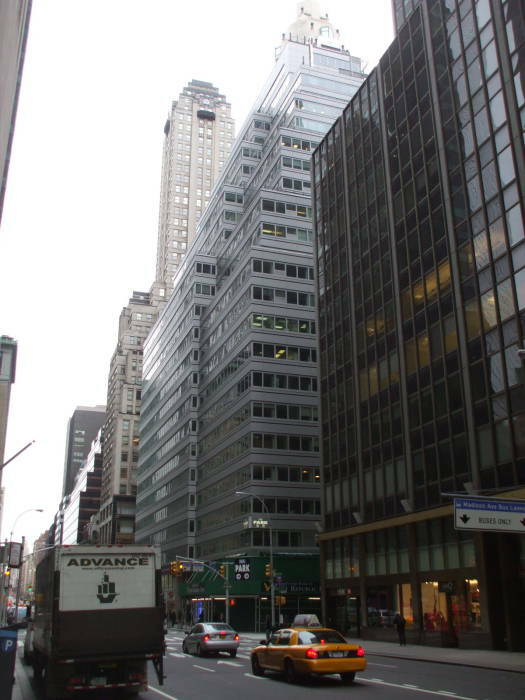 The secret entrance to its operational base in New York was said to be near the corner of Madison Avenue and East 59th Street, the intersection seen here. See Fictional Architecture of Manhattan for much more on the purported locations of events within the Marvel universe. 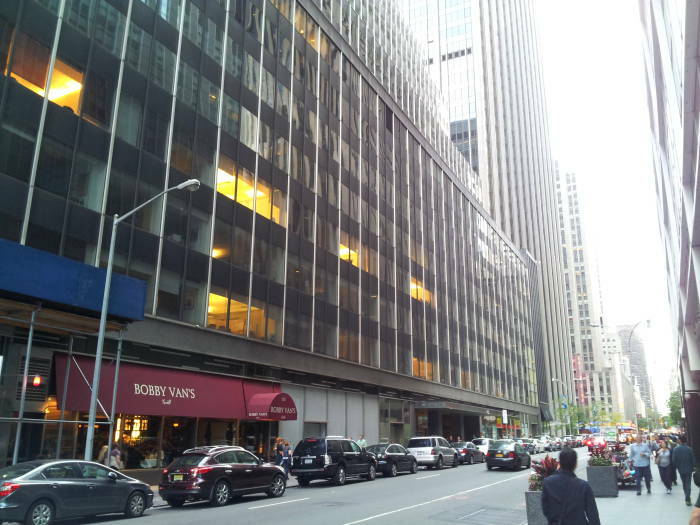 635 Madison Avenue is the black building on the far corner of this intersection. 575 Madison Avenue is the silver building with multiple setbacks at the for corner of the next intersection. 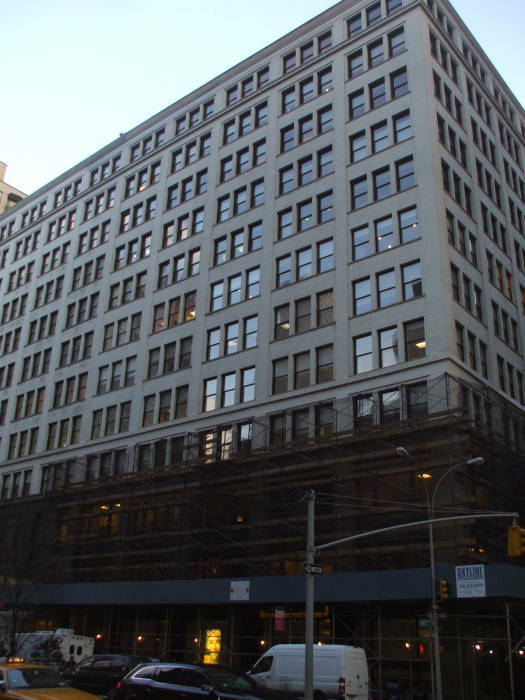 Marvel moved just about a block south in the 1970s, to its new home at 575 Madison Avenue. The Bronze Age of Comic Books is generally considered to have been the period from about 1970 through 1985. Many of the superhero conventions remained the same, although darker and more socially relevant plot lines reminiscent of the Golden Ages returned (for example, early Superman issues had addressed child abuse and child labor). Drug and alcohol abuse, poverty, racial prejudice and environmental issues featured in some of the story lines. Minority superheroes began to appear in significant numbers. The United States Department of Health, Education, and Welfare approached then-editor-in-chief Stan Lee in 1971, asking him to do a story about drug abuse. Lee came up with a three-part Spider-Man story portraying drug abuse as dangerous and grim. The Comics Code Authority, a self-regulating organization created by the industry in the mid 1950s in response to public worry over supposedly immoral and otherwise negative influences of comic books, refused to approve the story. Lee published the story anyway. The CCA changed their rules to allow the depiction of the negative effects of drug abuse, and also relaxed their rules restricting supernatural and horror genres. 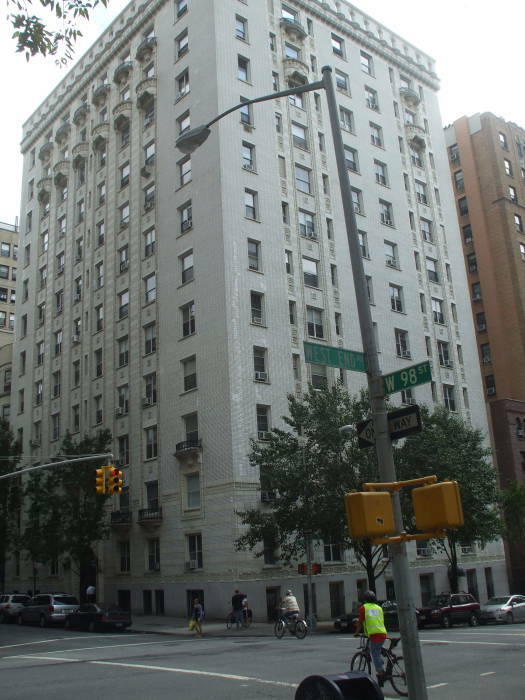 Marvel was based at 387 Park Avenue South in the 1980s. This location between 27th Street and 28th Street is the farthest south of all of Marvel's centers of operation. The convention is that the Bronze Age ended and the Modern Age of Comic Books began around 1985-1986, with the appearance of works by writers and artists like Alan Moore and Watchmen, and Frank Miller and Batman: The Dark Knight Returns. Given the grim and sometimes dystopian nature of many of the more recent works, some instead call this the Dark Age of Comic Books. 10 East 40th Street has a tall tower above multiple setbacks. 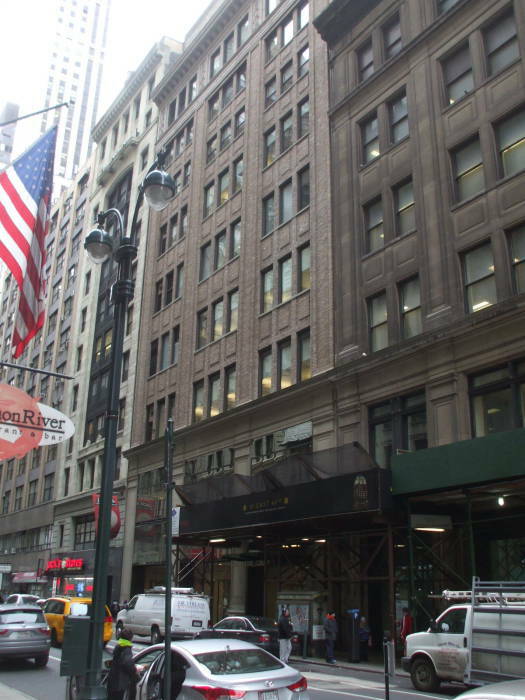 Marvel was based at 10 East 40th Street in the 1990s into the early 2000s. Scott Sackett is a comic book artist, and while he hasn't worked for Marvel (yet! ), he has met many of their editors and has visited their offices twice. The first visit, in May 2003, was when they were still on 40th street. Marvel was on floors 9, 10, and 11 — receiving, editorial and the bullpen, and administration, respectively. Scott's page has the details, along with several photos. His second visit was after they had moved to 417 5th Avenue, when security was stricter and photos weren't allowed. Since Marvel's purchase by Disney, security has become more restrictive yet. 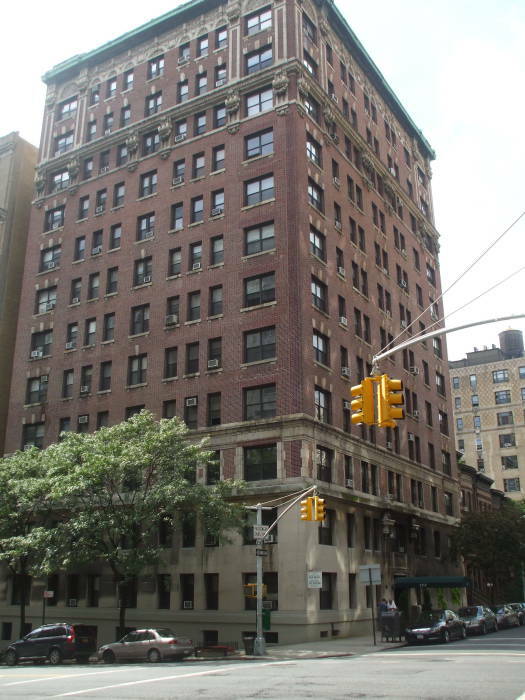 Marvel was based at 417 5th Avenue until 2010. 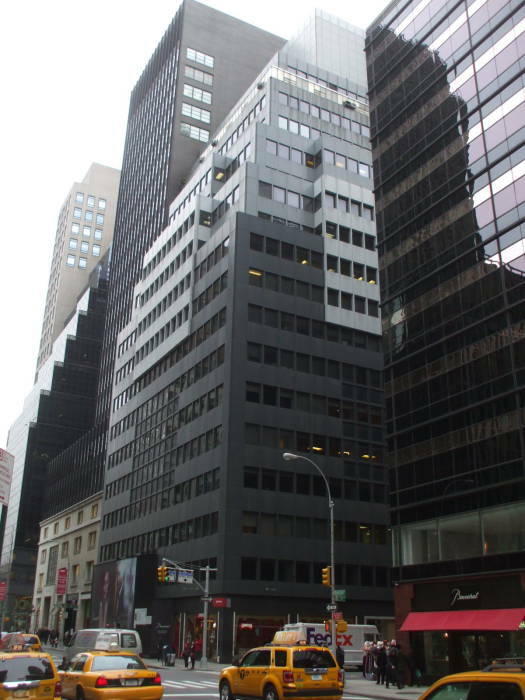 In 2010, Marvel moved to their current headquarters at 135 West 50th Street, just northeast of Times Square. Marvel headquarters is between Sixth and Seventh Avenues. That's Radio City Music Hall down 50th at the next corner, at Sixth Avenue or the Avenue of the Americas. You see the exterior of this building in Captain America: The First Avenger, where it portrays a SHIELD facility close to Times Square. I think it also appears in The Avengers.